Join us on October 25, 2018 to celebrate Read for the Record® and the power of reading! Jumpstart’s Read for the Record brings together millions of people each year in classrooms, libraries, community centers, and homes across the US. This annual campaign was launched over a decade ago to highlight the importance of building early literacy and language skills for EVERY child, so that all children have the opportunity to enter kindergarten prepared to succeed. 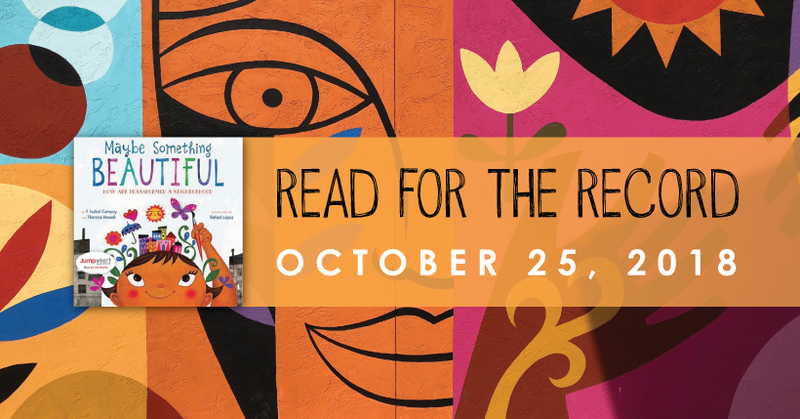 This year’s book selection, Maybe Something Beautiful, by F. Isabel Campoy and‎ Theresa Howell, and illustrated by Rafael López, celebrates the magic that can happen when a community comes together to create something beautiful and bring about change — a fitting metaphor for a campaign that features thousands of events in communities across the country each year. Every year, Jumpstart produces a special edition of its Read for the Record campaign book that features vocabulary tips, reading comprehension questions, and more resources to ‘jumpstart’ a child’s curiosity. Special editions are available in both English and Spanish. Click here to join the fun and order your Jumpstart special edition of Maybe Something Beautiful today!